Freshwater turtles and tortoises imported from foreign countries due to their unique appearance . Two species that have evidence to reproduce in Indonesia wild environment are Chinese Soft Shell Turtle (Pelodiscus sinensis) and Red Eared Slider (Trachremys scripta elegans). 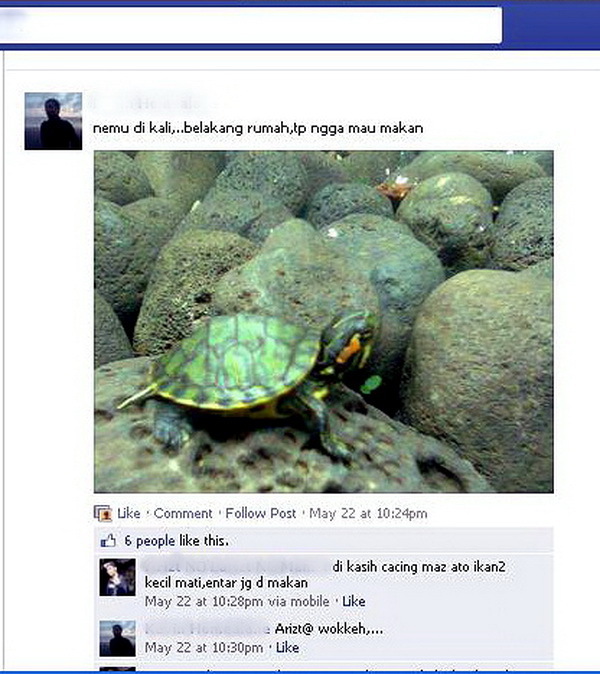 Based on our field observation, information from turtle hobbyist and photos uploaded in social media such as facebook, it is confirmed that both of these species are able to reproduce in Indonesia wild environment. Their offspring are discovered in some rivers in Java and Sumatra, especially in big cities such as City of Medan and Surabaya. Nevertheless, the study to investigate their impact on rivers and another rivers species in these areas are not conducted yet. In another places and countries, both of these species are believed seriously impact on native rivers species such as fish. Even, considered produce negative impact on native environment. Therefore, it is needed to study their impact on Indonesia environment. Both of these freshwater turtles inhabit local rivers can caused by some factors: the pet owners are bored to care and keep them, so release them to rivers; separated from the ponds due to flooding; releasing ceremony by religion group such as buddhism. An awareness to these group – pet owner/hobbyist, religion group – are important to carry out, so the negative effect of non-native species to native environment are can be managed.